Many Microsoft SQL Server users have taken the first step to protect sensitive data such as Personally Identifiable Information (PII), Protected Health Information (PHI), Primary Account numbers (PAN) and Non-Public Information (NPI) by encrypting their databases with Transparent Data Encryption (TDE). It is extremely easy to implement TDE encryption as it does not require program changes. A common cause of audit failures might not be so obvious and that is the failure to properly protect the SQL Server key encryption key once you activate encryption in SQL Server. 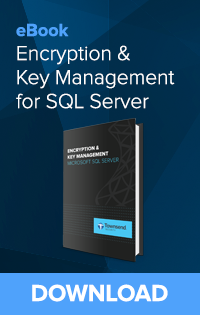 With Transparent Data Encryption you have the choice of storing the service master key within the SQL Server context itself, or protecting the master key with a key management system using the SQL Server Extensible Key Management (EKM) interface. Why is it important to do this? Simon McAuliffe provides the clearest explanation I’ve seen on the insecurity of locally stored TDE keys in SQL Server. I don’t agree with him on the question of using a key manager to improve security. Given that there is no perfect security, I believe that you can get significant security advantages through a properly implemented key management interface. First create a new asymmetric key pair within the AKM Administrative Console using the “Create EKM Key” and the “Enable Key for EKM” commands. In this example, NEW_TDE_KEK is the name of the new key on AKM, and my_new_kek is the key alias. Note that you do not have to take the database offline to perform this action. Of course, there are other steps that you should take to secure your environment, but I wanted to demonstrate how easy it is to make the change. The SQL Server DBA and the network administrator will have lots of other considerations in relation to SQL Server encryption. This includes support for clustering and high availability, automatic failover to secondary key servers, adequate support for separation of duties (SOD) and compliance, and the security of the credentials needed to validate SQL Server to the key manager. All of these concerns need to be addressed in a key management deployment. For SQL Server users who deploy within a VMware or cloud infrastructure (AWS, Azure), Alliance Key Manager can run natively in your environment, too. It does not require a hardware security module (HSM) to achieve good key management with SQL Server. You have lots of choices in how you deploy your key management solution. It turns out not to be difficult at all to address your SQL Server encryption key insecurities!